Entering my exhibition focused internship at the Gadsden Arts Center in Quincy, I knew that I would be working with the curator setting up art shows. What I didn’t realize was exactly how much work goes into maintaining a successful gallery. Even before I began working, I was forewarned that this was one of the busiest times of year at the Gadsden Arts Center due to planned exhibitions and the yearly fundraiser. However, I have enjoyed every moment of this internship because of it’s focus on art. There’s really not much down time while I’m at the art center. I remember after the first significant assignment was complete I asked my boss, Mrs. Angie Barry, “what’s there to do in between shows?”. She responded with a strong “You’ll see,” and she was right about that. Although the gallery is quiet and usually empty throughout the day with the exception of occasional gallery tours and evening classes, the employees are busy planning future events. Artist exhibitions, volunteer trips to art inspired locations, and raising money to remain open are daily tasks. My first and favorite experience was curating and hanging the work of watercolor artist Dean Mitchell. In preparation for his opening, Angie and I unpacked his work and inspected them for dirt, hair and other problems that arise depending on how the art was framed. For each piece there was a sheet we filled out describing the condition the GAC received the work so they wouldn’t be liable to cover damages. Before working closely with Angie, I never realized how many decisions were included in hanging art for a showing. Angie brought up factors like how different mediums and colors either complement or aren’t compatible next to each other, and the importance of sizes and whether or not the art is horizontal or vertical. All are details typically taken for granted by viewers in a gallery. Most recently, up until this past Saturday, I’ve been working on the GAC’s biggest and only fundraiser: their GALA. Essentially the GALA is a silent auction where board members, sponsors, volunteers and artists are invited to bid on various artworks and gifts. 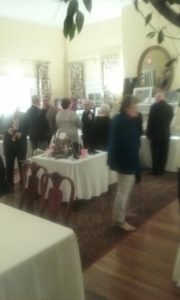 All the proceeds went to the Gadsden Arts Center. For weeks, donated items needed to be accounted for, and lights were to be strewn throughout the venue. My job for the event was to sell drink and raffle tickets, which at first wasn’t too busy until later in the night when people had got a few drinks in them and wanted more. Pertaining to the auction, out of around 105 items the gallery sold all but seven of them. So in more ways than one, the night was a success. According to our upcoming agenda, there will be more pleasant events this semester as well.